Happy Easter! I took opportunity of the occasion to try out another recipe from one of my current bookshelf must-haves, Alice Medrich’s Flavor Flours. The hubby had marked the particularly tempting Carrot Spice Cake for my list to Things He’d Like Me to Make, so I pulled out the carrots and cake pans to give Alice Medrich’s carrot cake a whirl. Flavor Flours focuses on the world of flours beyond white all-purpose flour, so this cake uses a combination of rice flour and oat flour for a delicate texture and richness of flavor. Alice’s recipe makes a single sheet cake in a 13″x9″ pan, but I wanted to do a smaller layer cake, so I adjusted the amounts to make two 6″ round layers that I sliced in half horizontally to make four layers. I like the visual elegance of thinner layers with the frosting, plus the additional layers allows for more of the frosting, which I think everyone always wants, yes? The cake baked up wonderfully in cake pans; it’s a very moist cake since it uses vegetable oil, so be sure to check it’s fully done before you pull it out. Because of the moistness, it’s also a little trickier to slice into layers compared to tighter-crumbed cakes – I actually found a serrated knife worked a little better than my usual cake leveler in this case. Take your time and you shouldn’t have too much of a problem. Or, you can always just keep the two thicker cake layers and fill with one layer of frosting for a simpler cake. 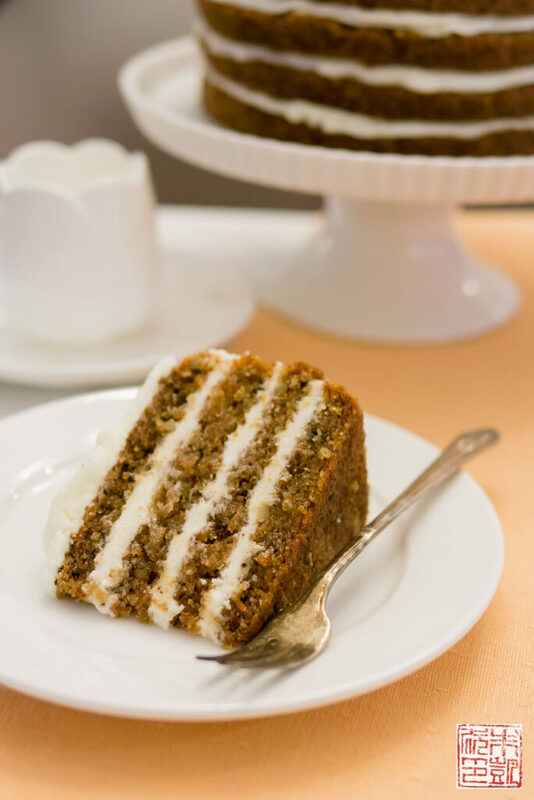 Either way, the cake is delicious; not too sweet, nutty and lightly spiced, it’s a perfect springtime version of a spice cake. Side note: the gorgeous cake server is from Alessi’s Dressed collection – I’m such a huge fan of their dinnerware and kitchen items! -Use full fat cream cheese for better consistency. Use the solid bricks of cream cheese, not the tub kind. – Don’t over beat the cream cheese as that will cause it to become runny and it won’t firm up again. In my method below, I add a bit of confectioners’ sugar to the cream cheese before beating to help keep it stiff. Still, only beat on low until it’s combined. – Have the butter at room temperature as this lets it incorporate faster into the frosting without overheating. – If it’s still too soft, you can always add more confectioners’ sugar, but hopefully using the tips above will help you from having to use too much and end up with a too-sweet frosting. Also, you can refrigerate soft frosting for 10-15 minutes to let it firm up as well. cake recipe adapted from Alice Medrich's Flavor Flours If you want to make a regular 9" round cake, doubling the recipe will give you two 9" round cake layers that you can split in half to make four thin layers. Preheat oven to 350 degrees F. Grease two 6" round by 2" deep cake pans. Line the bottoms with parchment paper. Combine oil, sugar, and eggs in the bowl of a stand mixer fitted with paddle attachment. Beat on medium speed until combined and light in color, about 2 minutes. Combine flours, baking powder, baking soda, spice, and salt in a medium bowl. Add to mixer bowl and beat on low speed until combined. Add carrots and walnuts and beat on low speed until combined. Divide batter between the prepared pans. Bake for 30 minutes on 350 degrees F, then lower oven temperature to 325 degrees F and bake for 15-20 more minutes, until a toothpick inserted in the center comes out clean. Remove pans and let cool on wire rack before frosting. Place cream cheese and ½ cup (55 g) of confectioners' sugar in the bowl of a stand mixer fitted with the paddle attachment. Beat just until cream cheese is smooth and confectioners's sugar is incorporated. Add butter and vanilla and beat just until smooth. Add in 2½ cups (275 g) of confectioners' sugar and beat just until smooth. If it looks too soft, add up to another cup (110 g) of confectioners' sugar to stiffen it up. You can use the frosting immediately, or if it still looks too soft, refrigerate for about 20 minutes to let it firm up. If you're not piping any designs onto the carrot cake, it should be fine for spreading. Carefully slice each cake layer horizontally into two layers. Place one cake layer on a cake board or cake decorating stand. Spread or pipe a layer of cream cheese frosting on top of the cake layer. Top with a second cake layer and repeat the process with the remaining cake layers. Spread a layer of cream cheese frosting on top of the final cake layer. You can add decorations as you like. The cakes are gorgeous–I love the roses on top! 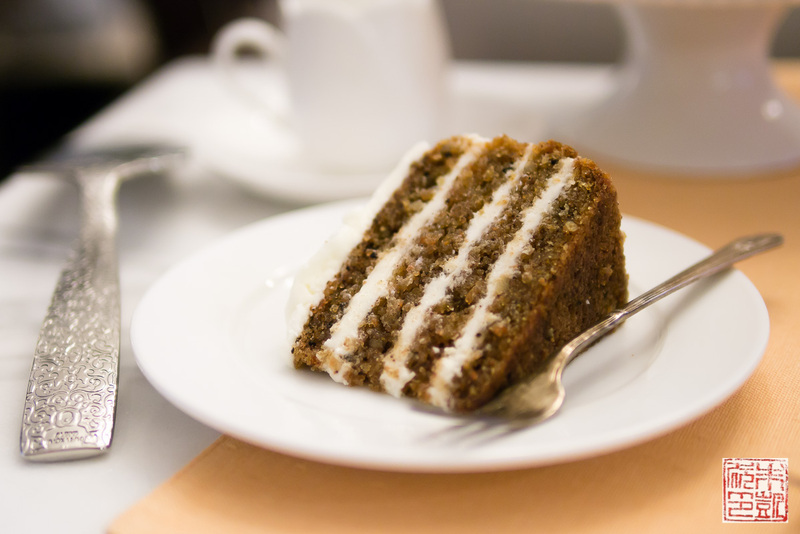 I love carrot cake, so I’ll definitely have to try this version next time. This is gorgeous, I love the simple, clean frosting and deco…and those layers! 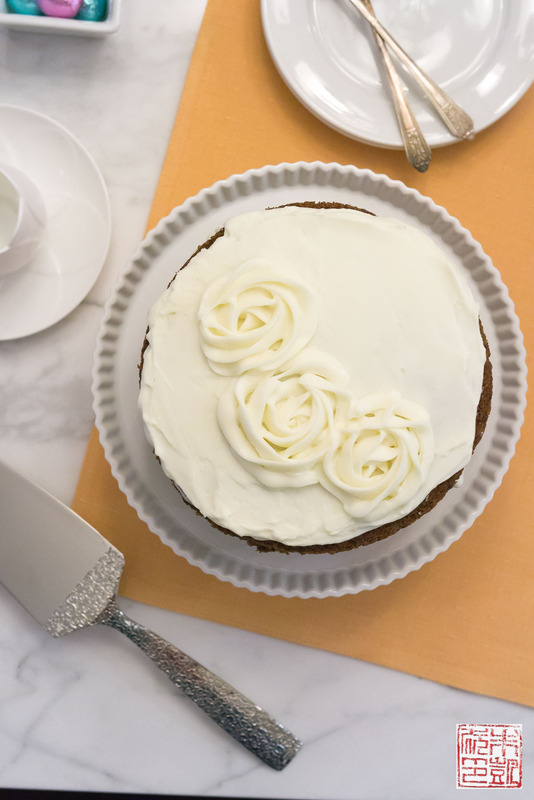 You can never have too many carrot cake recipes and this one looks great! What a gorgeous carrot cake and I’m seriously drooling over all those glorious layers of cream cheese! 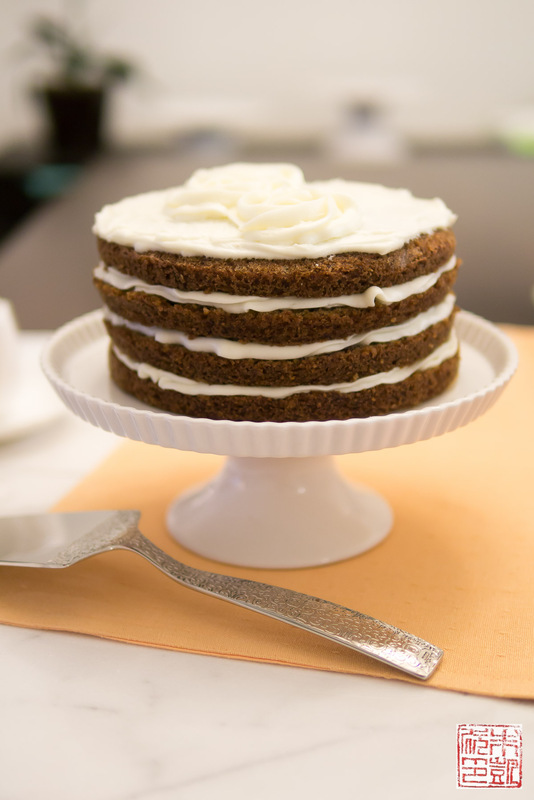 This cake looks delicious and carrot cake is one of our favorites!! I love the perfect simplicity / simple perfection of this cake! I love carrot cake so I know this would be right up my alley! Great pictures.